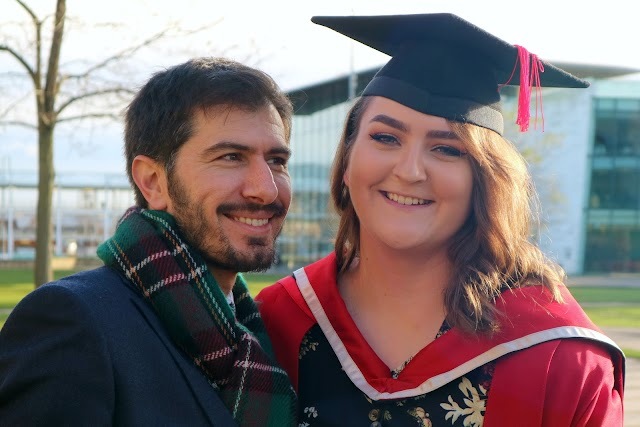 Eeeeek, I'm so so excited that I'm finally putting this post up! I really wanted all my photo posts to go live first and then for my haul and food post to go up later, but I've been itching to show you all the things that J and I bought. We'd done a lot of research before we went to try and figure out how much money we would need to take, and saved up a whole bunch so that we could treat ourselves. It had been a tough few months for us, so a treat was definitely in order. I'd also watched and read SO many recent Disneyland hauls to see what kind of merchandise was currently in the park, just so I could get an idea of what I'd like to buy. Now, I'll be honest, we bought way more than we intended to, but hey, when in Disneyland! So the first things I wanted to show you were the pins. I knew before we went that I would go crazy for the pins, but I managed to restrain myself (although 5 out of the 8 we got are mine... oops). 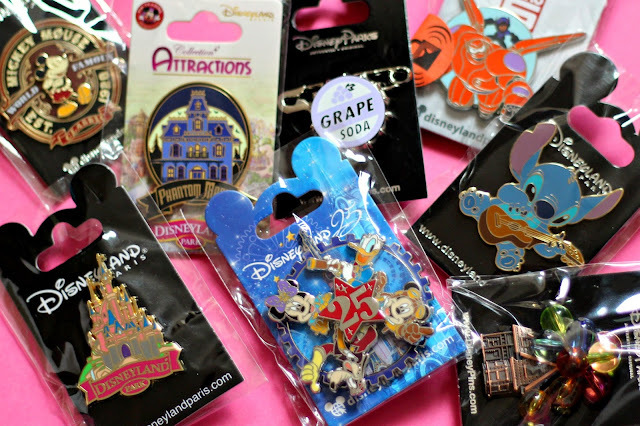 The two I'd seen in the hauls before we left that I knew I'd like was the Disneyland Park pin with the castle and the Grape Soda pin from Up. I managed to find both of them and thought that I was done, but oh no. I also decided to get a Phantom Manor pin because I bloody love the ride, a vintagey-looking Mickey Mouse pin and one of the spinning 25th anniversary pins with all of the characters on. I couldn't not get a 25th anniversary pin! J bought a Big Hero 6 pin that featured Hiro and Baymax, a Stitch pin and a little Up house pin with coloured bead balloons! I kind of never want to take mine out of the packets because they're all too pretty and I don't want them to break, but I've worn the Grape Soda one, purely because it wasn't in a packet. Keeping up with the theme of wearable items, I knew that I would like one of the Disneyland Paris jumpers that you can see above. We hunted all over the place for them until we finally stopped one in a shop in Frontierland. It was in an XXL, but because it was the only one, I thought 'sod it' and bought it anyway. It's the perfect jumper for chilly days and because it's pretty huge, J can wear it too! 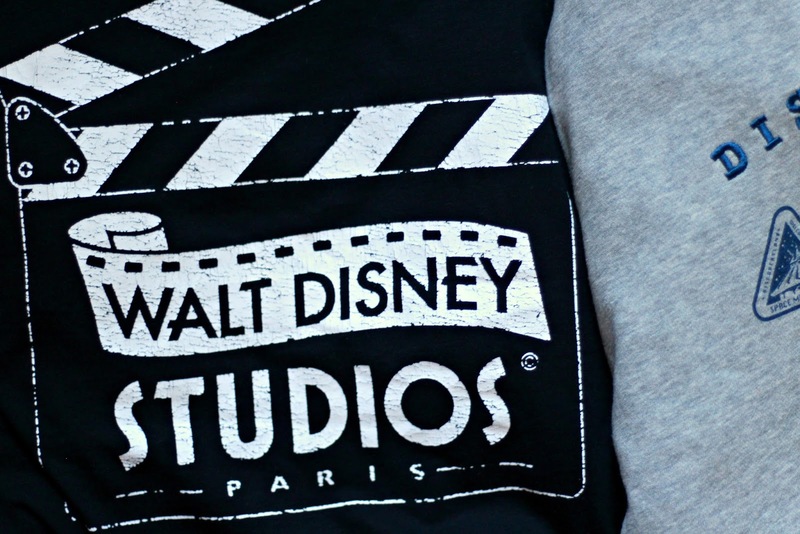 The last clothing item I bought was this Walt Disney Studios top. As you'll know if you've read my final photo post, the Studios park isn't my favourite, but I really liked the simplicity of this top. 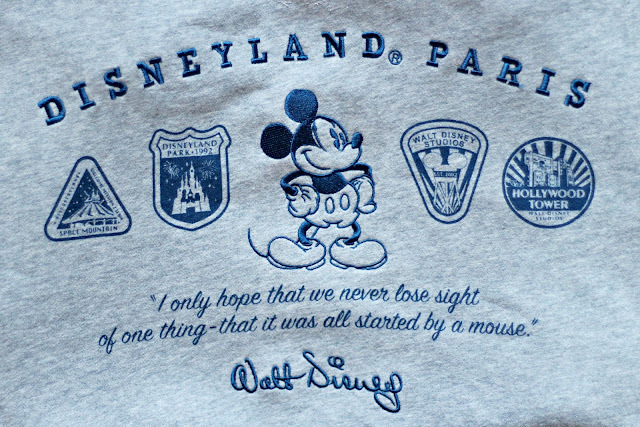 Plus, it says STAFF on the back and I just want to feel like I work in Disneyland. I bought this in the Tower of Terror shop, oddly enough, but I did see it dotted about in some of the other Studios shops. 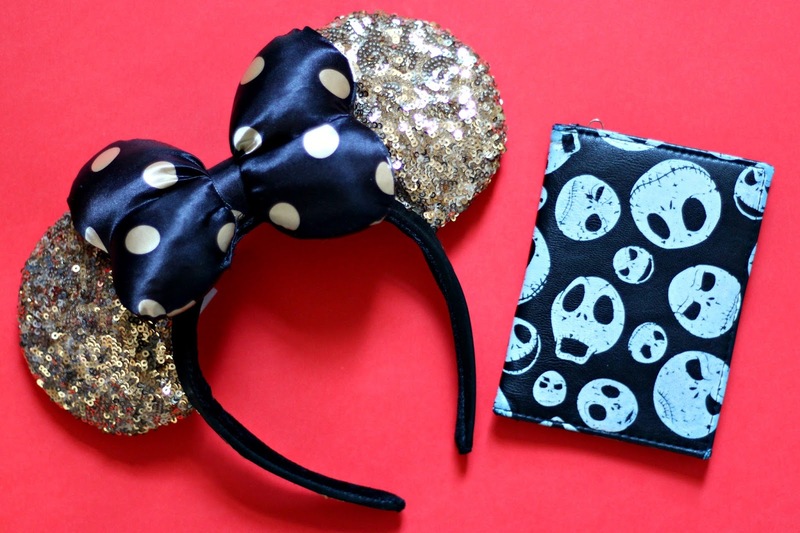 Of course, when in Disneyland, you've got to get some ears, so I picked up these 25th anniversary edition ears. I was trying on a few different ones and J held these up and said 'these are your aesthetic,' and do you know what? He's totally right! Despite loving all things colourful and sparkly, I pretty much only wear black, so these ears were the perfect mix. I bought these from Plaza East, which is directly on the right as soon as you walk through the entrance gates. J also picked up an accessory from the Frontierland shop where we found the jumper. He was after a new wallet and he'd said how much he wanted one with Jack Skellington on, and we found him one! It's black and features lots of Jack's facial expressions, and it's so bloomin' cute! Did we need a bag of sweets? Absolutely not, but had we heard that these were delicious and felt like we had to try them for ourselves? 100%. 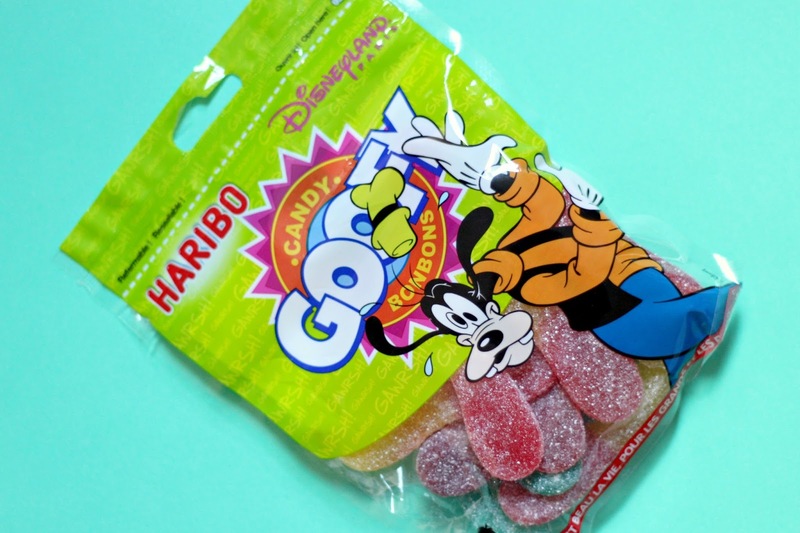 These are the Goofy Bonbons by Haribo and if I'm honest, I'm not a huge fan. They're not very soft so they hurt my teeth a bit, but J likes them, so if you're into fizzy, gummy sweets, you could maybe try these out if you're in the park. 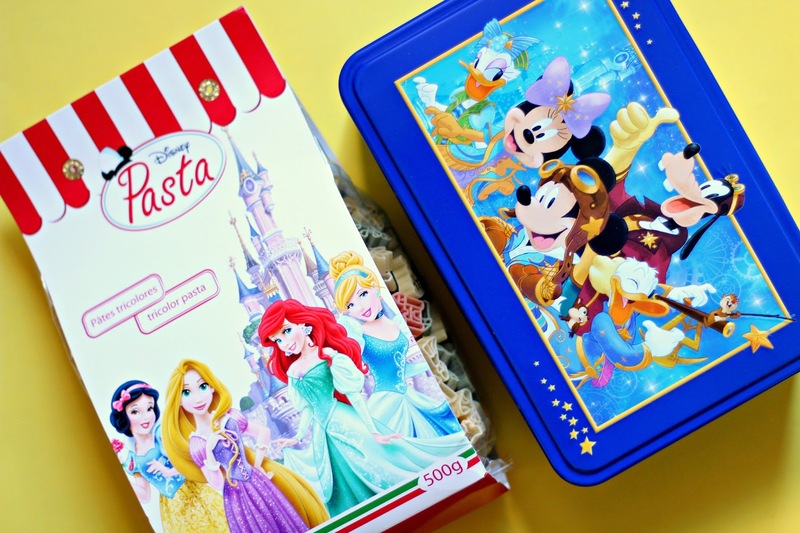 Some other food bits that we picked up were the princess pasta and a tin of 25th anniversary biscuits. I realise that the pasta is just a gimmick and it's literally a bag of pasta, but listen, it's in the shape of castles, shoes and princesses. Plus, it's delicious! We're down to half a bag now, which I'm a bit sad about, but it was totally worth buying. I kind of only wanted to get the biscuits for the tin and I thought that they might be a bit funny, but they're actually so yummy. They're kind of like thin shortbread and each biscuit has a print of a different character on, so it's really fun to see who gets which character. Again, we bought a couple more foodie items. In the background of this photo, we've got a bucket that used to have popcorn in, but if you've ever been to Disneyland Paris, you'll know how good the popcorn is. It's especially good if you go to one of the carts when they're made it fresh, so it's delicious and warm. We bought this bucket because we wanted to take the popcorn on the bus home as a snack. We didn't get many stops for food, so taking your own things to eat was essential. 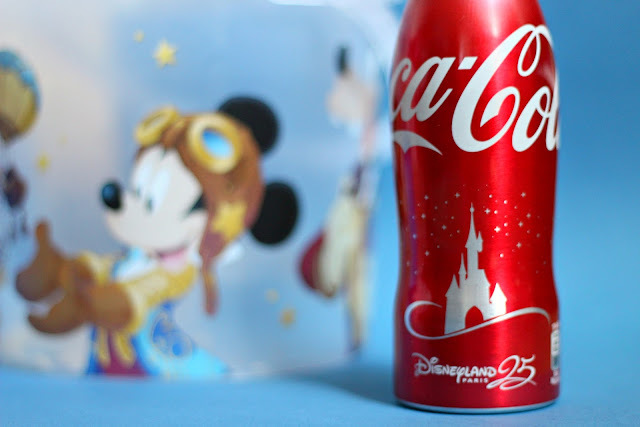 We also bought this bottle of Coca Cola, purely because it was a special 25th anniversary one. These are more expensive than the regular bottles, but it makes the perfect little keepsake. I'll be honest, all of this stuff in the photo above was totally unnecessary, but too cute to leave. Because I was gathering stationery bits for uni, I decided that it'd be nice to have a pen from Disneyland. This is probably the most expensive pen I own and you can find them dotted all around the park, but I picked mine up from the Emporium. 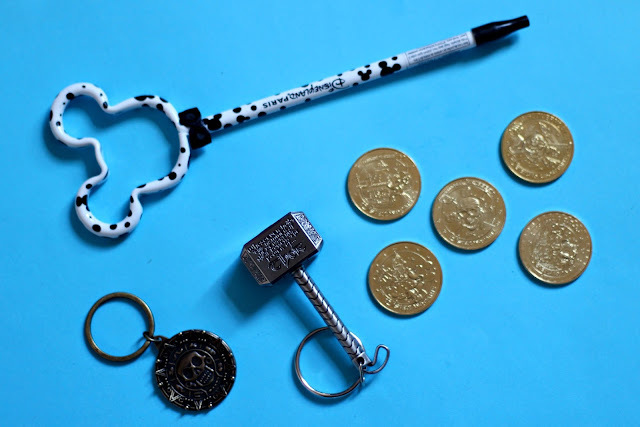 J became besotted with the Pirates of the Caribbean and the Thor hammer keyrings, and had some kind of internal battle with himself whether to buy them or not, but as you can see, they came home with us. One of his favourite things to do is boop me on the head with Thor's hammer, so that may be the reason why he ended up buying it. He also became obsessed with the coin machines that are all over the park. You pop in 2 Euros and a coin comes out. 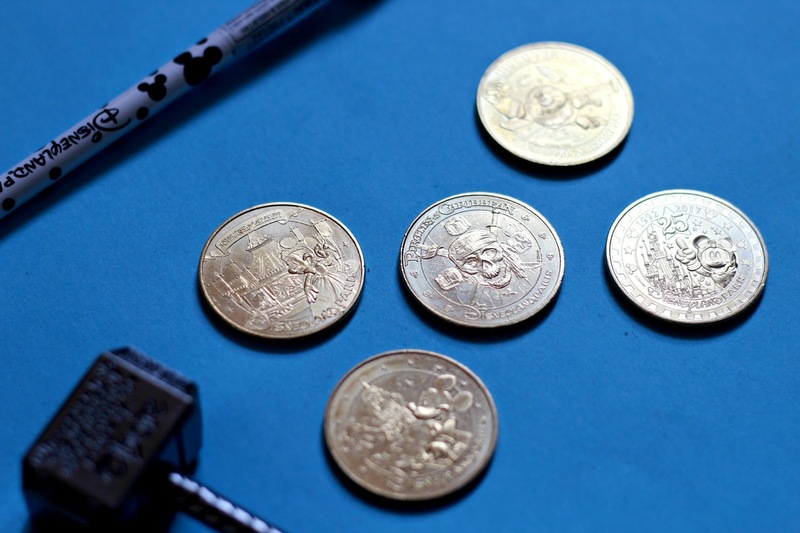 They're not like those machines where you put in a few cents and wind the crank - these coins just fall out, but they're thick and heavy, so you can tell they're a good quality. He built up a little collection of them and vows to get more next time we go. You can see the designs a little better in the photo below. This was something that I had an internal battle with myself about. 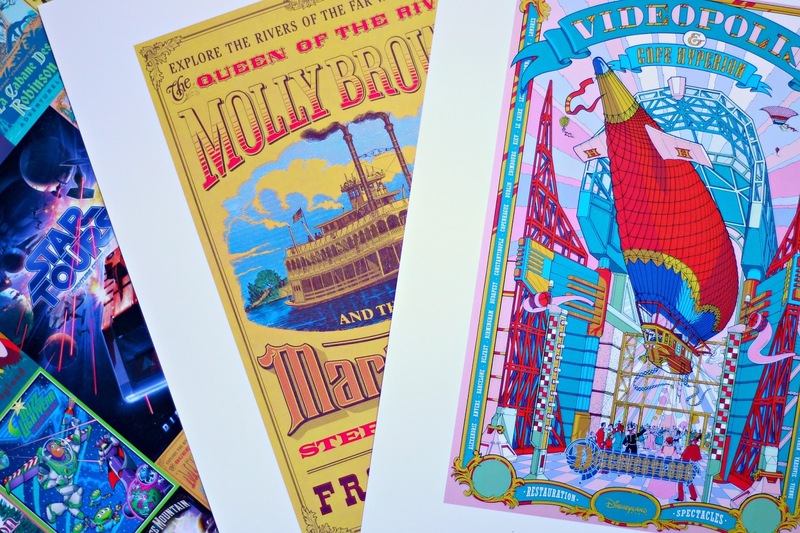 I'd seen in some of the hauls that people were buying art prints of the posters that you walk past when you first enter the main park, and I thought that they were absolutely beautiful, but I couldn't justify the price because I didn't know if I'd end up hanging them. As J rightly pointed out, I'm always looking for things to go on the walls and these can be saved for when we have our own house. 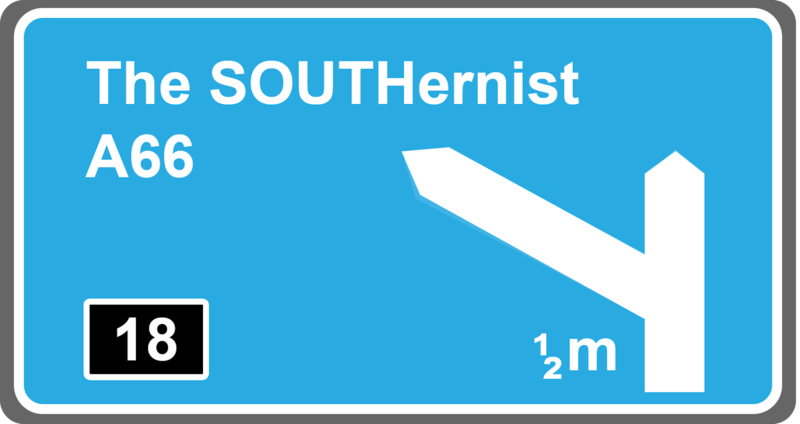 I can't put nails in the walls where we live at the moment, so when we've got our own place, I'll be scouting out the perfect spot for these. You get 12 prints in the set and they're such amazing quality. They match the park posters perfectly and the're all so vivid. We decided that while we were in Disney, it was the perfect opportunity to pick up a Christmas present or two for our goddaughter. 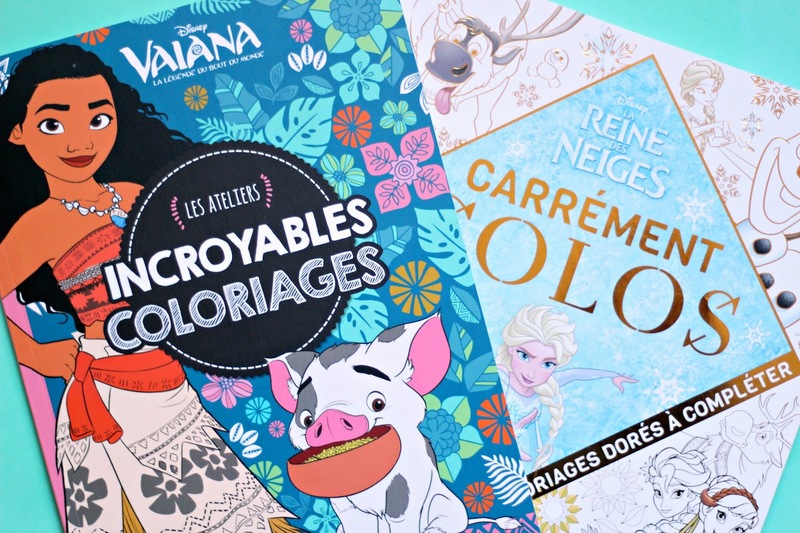 Originally, I wanted to find her a sticker book because she is absolutely loving stickers at the minute, but I couldn't find one anywhere. So instead, we opted for two colouring books featuring her favourite films - Moana and Frozen. I am totally not into those little statue things that you can buy in Disney and find a lot of them to be tacky and overpriced. J feels exactly the same way, but when he saw this Jack Skellington candlestick, he just fell in love (he literally wouldn't stop looking at it as we wandered around the shop). It was getting close to the end of our holiday and we had a fair bit of money left, so I said to him 'why not just get it? 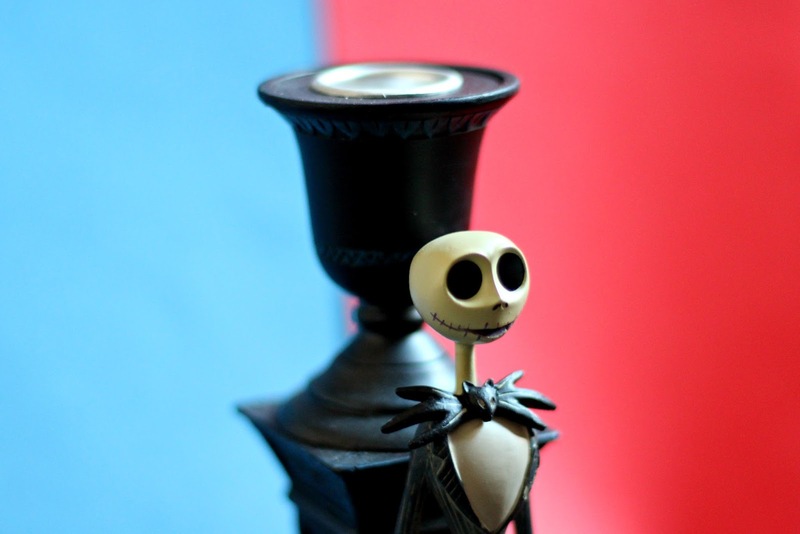 Halloween's coming and you love Nightmare Before Christmas.' So he looked at the price and was almost bowled over when he saw that it was only 16 Euros. I thought that it was at least going to be over 30, so of course, he bought him. He now stands proudly in our living room and has had a candle lit every night. And finally, we have the last two items which were things that I gave to my sister for her university accommodation. First of all, we've got another bag of pasta. When you're a student, pasta is one of your staples, so this was an absolute must. I also bought her a Yoda mug, purely because she introduced me to this song and whenever I see Yoda, he reminds me of her and that stupid song. 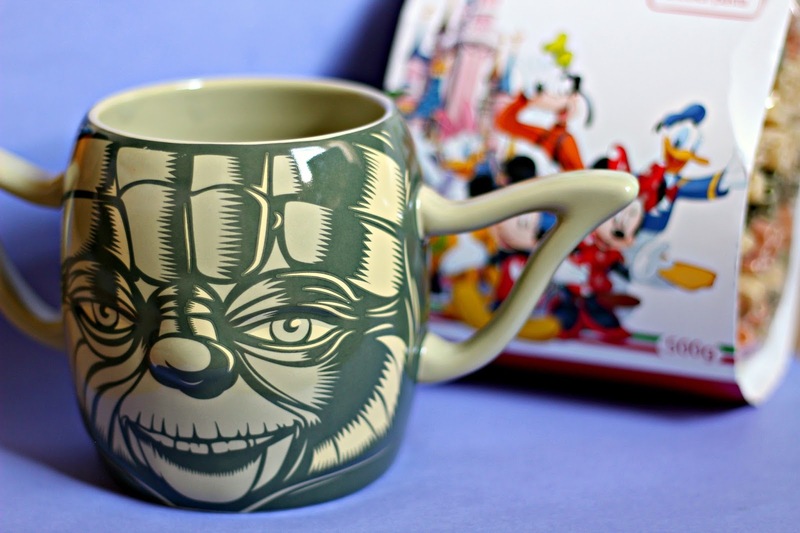 Plus, it's a massive mug so it'd be perfect for soup as well as tea or fancy hot chocolates! And there we have it, that's absolutely everything that we bought in Disneyland Paris. Stay tuned next month for my Disney food post - it's going to be a good'un! I'd love to know what bits you've bought from Disneyland in the past or if any of these items have taken your fancy.